What makes the Smart Tissue Autonomous Robot (STAR) such an important medical device advance is that it is automated, not manually controlled. Researchers have taught a robot how to perform a delicate procedure better than a human surgeon, according to the MIT Technology Review. The Smart Tissue Autonomous Robot (STAR) stitched a live pig's intestine together with a needle and thread, using an advanced 3-D imaging system and "very precise force sensing to apply stitches with submillimeter precision," the MIT article says. The system even outperformed its inventors at Children's National Health System in Washington, D.C., who designed it to copy state-of-the art surgical practice. A report on the research appeared in Science Translational Medicine. Robotic surgery has been around for ages. 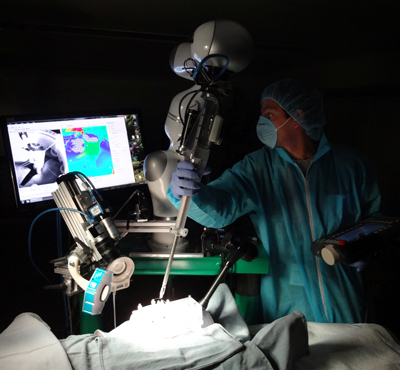 The difference here is that the robot surgeon is automated, not manually controlled. The researchers added several custom-made components to an industrial robot, including a force-sensitive suturing device and a 3-D near-infrared camera that can image soft tissue in detail, using fluorescent markers. A computer program based on best practices generates a plan to complete complex surgical tasks, such as suturing soft tissue and connecting parts of an intestine. The team compared the consistency of the robot's suturing and that of manual laparoscopic and clinically used, robot-assisted surgical techniques in terms of the pressure at which the sutured intestine leaked, the number of mistakes that required removing the needle from the tissue, completion time, and lumen reduction in intestinal anastomoses, according to the journal article. Also competing in the field of autonomous surgical robotics, Verb Surgical (backed by Google-parent Alphabet) announced in February that it is partnering with Johnson & Johnson to make robot surgeons smarter. Using its background in artificial intelligence, information sorting, and image processing, Verb said that it ultimately plans on making robots more accurate as well as less expensive. Although the company has been mum on the details, its website says that the near future of surgical robotics would have been "unimagined even a few years ago." The Verb was initially developed by SRI International, which helped develop the predecessor to Intuitive's da Vinci robot and, perhaps more famously, developed Apple's Siri voice recognition technology. SRI noted that the technology will "enable greater efficiency and improved outcomes across a wide range of surgical procedures." The Children's National teams results do not mean surgeons should start job-hunting, according to Peter Kim, a pediatric surgeon who led the researchers. A surgeon would still have to oversee the robot's work and take over in case of an emergency, such as unexpected bleeding, the MIT article said. However, working with a robot to improve patient safety and reduce complications "would be a tremendous benefit," Kim added. Ken Goldberg, a University of California, Berkeley, robotics professor who is also working on surgical systems, called the Children's research "an important result," and dubbed the STAR system's 3-D sensing "particularly interesting." Goldberg and his team are working on robots that could learn from expert surgeons, rather than being manually programmed, the MIT report said. "Copying the skill of experts is really the next step here," he added. Learn more about cutting-edge medical devices at MD&M East, June 14-15, 2016 in New York City.